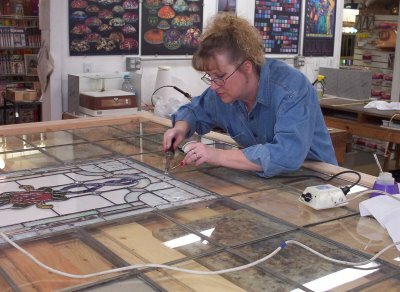 Roses Glassworks offers fair and comprehensive repairs for most stained glass art pieces. We will treat your art with respect; Always doing our best to restore your piece to original condition. When a piece of art glass is damaged beyond repair, we will gladly work with you on creating a replica of your art, or designing the new piece of your dreams. Roses Glassworks no longer repairs Paragon kilns, please refer to Paragon's website for a listing of available kiln technicians.